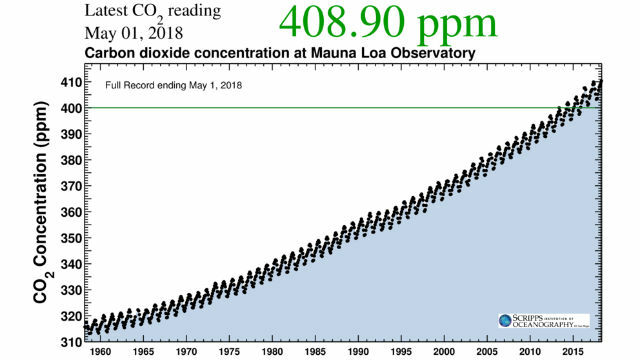 The average concentration of carbon dioxide in Earth’s atmosphere reached a new high in April as measured by the Scripps Institution of Oceanography at the Mauna Loa Observatory in Hawaii. 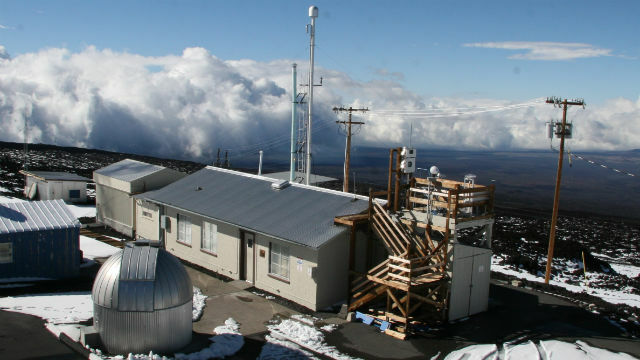 Instruments at the 11,000-foot-high observatory on the volcano’s north slope measured 410.31 parts per million in April, up from 400 ppm in 2013 and 315 ppm when measurements began in 1958. The latest average reading represents a 30 percent increase in carbon dioxide concentration since Scripps scientist Charles David Keeling began his measurements. His “Keeling Curve” has traced a steady increase over the past 60 years, and the measurement program is now directed by his son, Scripps geochemist Ralph Keeling. Carbon dioxide is called a “greenhouse gas” because of its ability to trap solar radiation and keep it confined to the atmosphere. It is the most prevalent greenhouse gas produced by human activities. Prior to the onset of the Industrial Revolution, carbon dioxide levels had fluctuated over the millennia but had never exceeded 300 ppm at any point in the last 800,000 years.